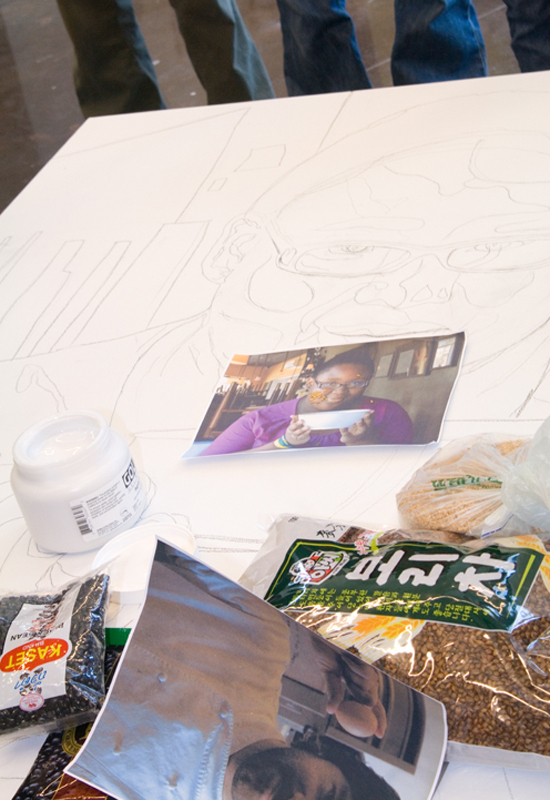 This portrait of Louie’s Kids participant Auja Ravenel was cooked up by students at the School of the Arts. It is one of four mosaics that will be auctioned at the Charleston Wine + Food Festival. 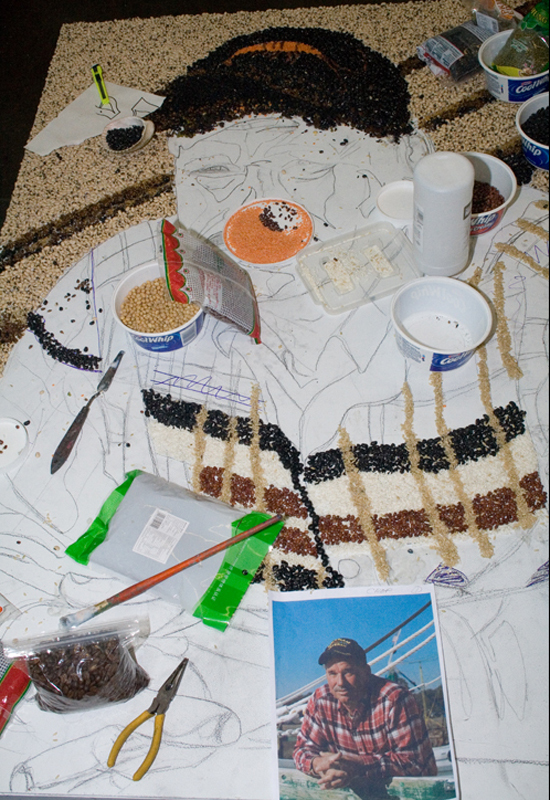 SECOND INSTALLMENT Let the gluing begin: With only a few weeks left, students start to get their hands dirty as they complete their first mosaic of 12-year-old Auja Ravenel It’s a rainy Tuesday morning when artist David Boatwright enters the School of the Arts classroom, his arms weighed down by bags full of rice and beans purchased from Whole Foods and a local Chinese grocery store on Montague Avenue. 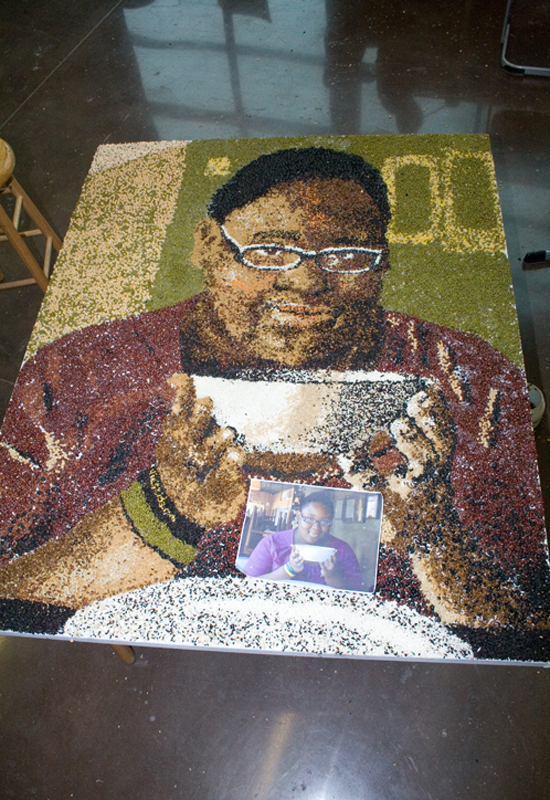 Within seconds, a dozen eager high-schoolers are rummaging through the packages of beans, sorting them by color, determining their plan of attack for the first rice-and-bean mosaic of Auja Ravenel, the 12-year-old Louie’s Kids participant. Using photos taken by Boatwright, students spent several days prior tracing four portraits onto separate four-by-six-foot wood panels. 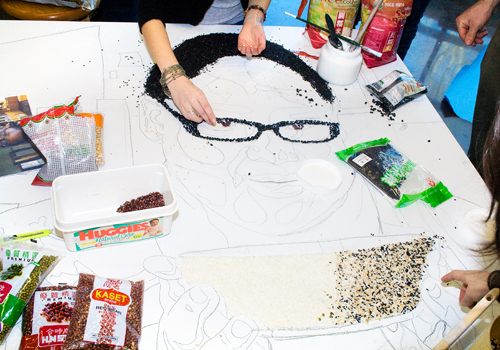 On Ravenel’s portrait, they carefully outlined every detail with a black marker—from the folds in her shirt, to her black-rimmed glasses to the shadow on her left cheek. 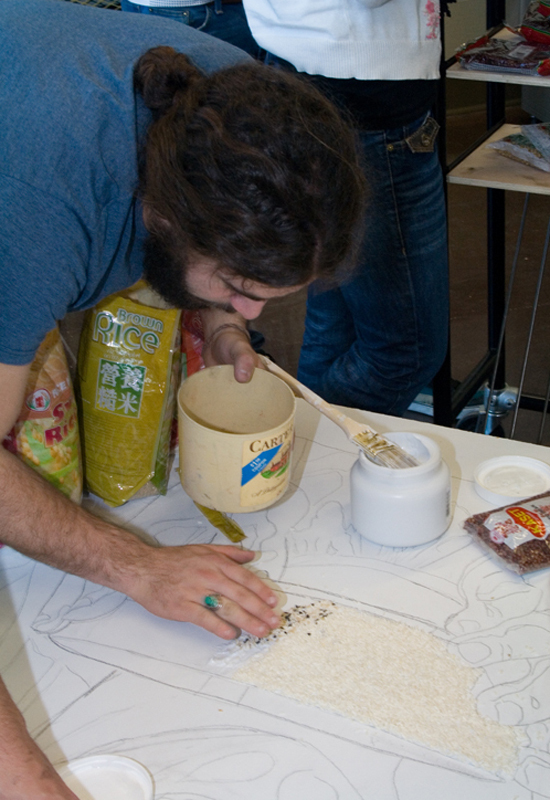 Now, with some guidance from Boatwright, they will begin gluing the rice and beans. 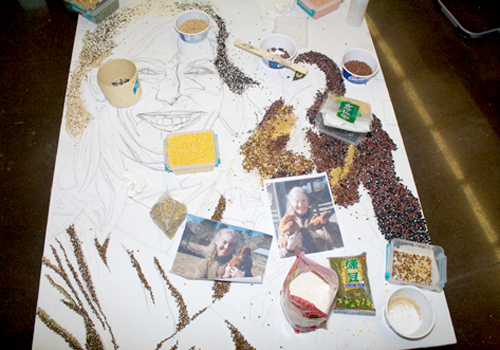 Before the creative frenzy begins, art teacher Ben Moore offers a few instructions, recommending which brushes and how much of the acrylic glue to use and giving one final reminder: “We want it to be as precise as we can…for beans,” he says. The students don’t waste any time, and watching them, you’d think they’re old pros. Many of them have shared a class since the sixth grade, and according to Moore, they’re a lot like a family, knowing the best ways to work with each other. As Boatwright answers questions, counseling students on which beans to put where, he steps back to reflect on the high schoolers crowded around a single wood panel. “They remind me of the monks in Tibet constructing sand art,” he says. Boatwright will stick around to assist the students with the first mosaic of Ravenel but plans to leave them to create the other three works of art on their own (with a little help from their art teachers). Stay tuned to hear how these young artists fare with their renditions of chef Mike Lata, shrimper Wayne Magwood, and farmer Celeste Albers—all to be auctioned off for the Charleston Wine + Food Festival to benefit Louie’s Kids and Slow Food Charleston. For more information on Louie’s Kids, click here. For more information on Slow Food Charleston, click here. For Charleston Wine + Food Festival tickets and information, click here. For the Charleston Wine + Food Festival online auction, click here. FIRST INSTALLMENT Grab a few eager high school art students; then mix them with a local shrimper, a talented chef, a Wadmalaw egg farmer, a determined elementary student, and a renowned muralist. Sprinkle in some teamwork, and garnish with a dash of fun. The result? Four creative (and almost edible) mosaics that reflect the importance of local culinary traditions. 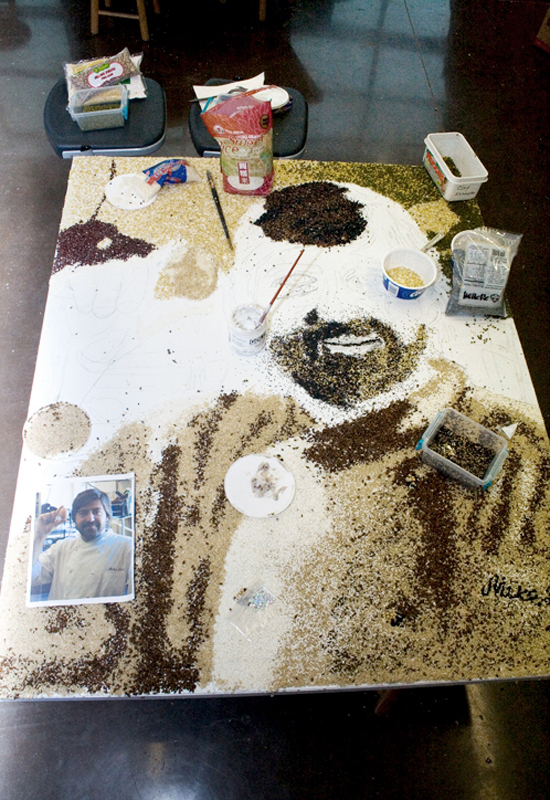 Louie’s Kids, Slow Food Charleston, and Charleston Wine + Food Festival have teamed up with the School of the Arts (SOTA) for this unique project, with artist David Boatwright signing on to assist the imaginative SOTA visual arts students in using dried foods (think beans and rice) to make large mosaic portraits of individuals who represent the cycle of food in the Lowcountry. Not only will the project “help the community reconnect with their food and heritage in a sustainable way,” says Slow Food member Melissa Clegg, but the works will be auctioned off at the upcoming festival (March 4-7) to benefit two nonprofits: Louie’s Kids, a locally based group working to fight childhood obesity, and the Charleston chapter of Slow Food USA, whose mission is to reconnect Americans with the people, traditions, plants, animals, soil, and water that produce their food. 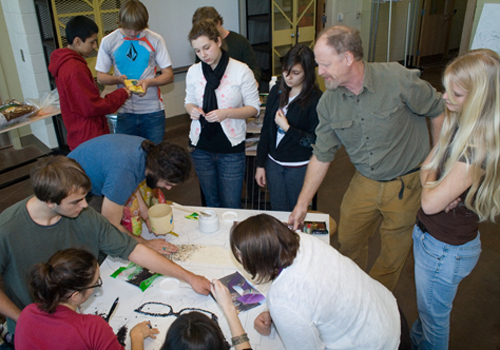 The concept began simmering in early January when SOTA students joined Boatwright to visit two of their subjects at FIG. While the artist snapped their portraits, students mingled with chef Mike Lata, a founding member of Slow Food Charleston, as well as Auja Ravenel, a 12-year-old from Burke Elementary School who lost 64 pounds while participating in the Louie’s Kids program. They asked questions and listened intently as Lata shared his experience with Slow Food Charleston and talked about how he was “excited and humbled” to be part of this project. They chatted with Ravenel and learned how much her lifestyle improved from being a part of Louie’s Kids. The team also did their homework on the other two purveyors they’d be portraying: Celeste Albers of Green Grocer farm on Wadmalaw and Wayne Magwood, a local shrimper and former president of the South Carolina Shrimpers Association. By the time they’d gotten familiar with each of these inspiring Lowcountry residents, students were excited and ready to dive in to their beans and rice creations, despite being a little nervous about the undertaking. “I’m stoked about the mosaics because they’re allowing us to help others,” says 17-year-old Joey Dixon. “It’s cool to know our work is effecting other kids.” For more information on Louie’s Kids, click here. For Charleston Wine + Food tickets and information, click here. A budding initiative volleys to foster academic success through the sport of squash.